ED Pulse Poll Results: Which Attributes Best Reflect Personalized Learning? ASCD continually seeks to provide solutions to the challenges that face educators of all levels. 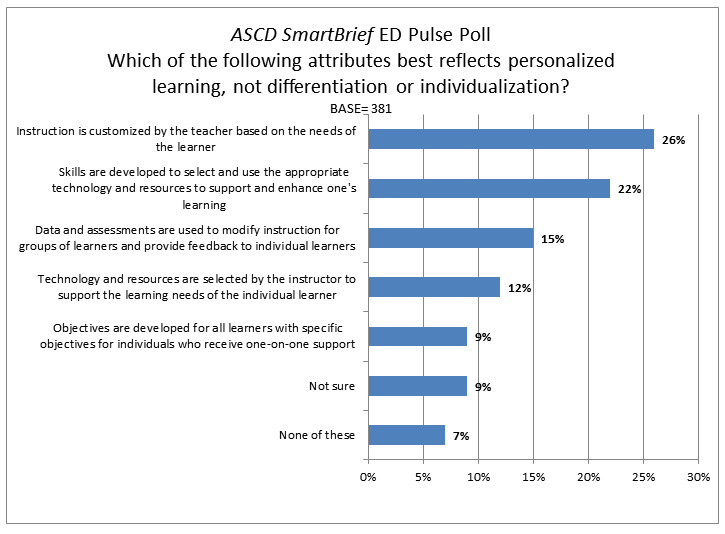 Recently, the ASCD SmartBrief ED Pulse poll asked readers about the attributes of personalized learning. Personalized learning has been identified as a revolutionary way to center education on the student, which will require an overhaul in some of the currently accepted methods of teaching. Much more student-directed than individualized or differentiated instruction, it is a newer trend that may or may not have wide understanding. With this in mind, a recent ED Pulse poll sought to assess the level of knowledge of some features of personalized learning among readers of ASCD SmartBrief. Using a chart developed by Personalize Learning, the ED Pulse question offered five different attributes that might or might not reflect actual personalized learning. The attribute that did reflect personalization was skills are developed to select and use the appropriate technology and resources to support and enhance one's learning. A total of 22 percent felt this reflected personalized learning. The other attributes were reflective of either differentiation or individualization. Because the attribute of instruction is customized by the teacher based on the needs of the learner (26 percent) received the most votes as the feature that reflected personalization, when in actuality it reflects individualization, it is clear that educators need more professional development on the true meaning of personalized learning. This survey question was included in ASCD SmartBrief, a free daily e-mail news service that provides summaries and links to major education stories and issues, which has more than 200,000 subscribers. Using ED Pulse, the weekly online poll, data was collected from 341 readers, starting on December 5, 2013. Online surveys do not provide a random sample, as participants are self-selected, meaning that a margin of sampling error cannot be calculated or quoted. In addition, the population and sample are limited to those with access to computers and an online network. However, online surveys have been shown to produce results that have proven to be reliable predictors of outcomes, including election results. If you have a question on education that you would like to see addressed in a future ED Pulse poll, feel free to submit it in the comment section below, along with any other comments.